We’ve lost another good math teacher, that’s what’s wrong. [..] I know everybody wants to be the big cheese and be the big hero. But what we need is teachers, not more professors, advocates, rabble-rousers, or whatever. 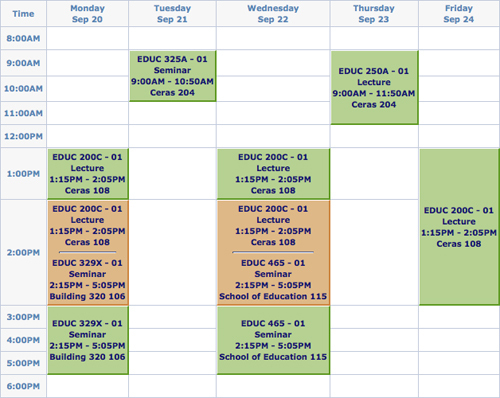 Mathematically, what’s wrong with this schedule? I mean, it trips me up every time I look at it. EDUC 200C – Introduction to Statistics in Education. Kenji Hakuta. EDUC 250A – Inquiry and Assessment in Education. Mitchell Stevens, Susanna Loeb. Towards a research proposal. EDUC 325A – Proseminar. John Willinsky, Martin Carnoy. Part one of three classes required of all doctoral candidates. They’re trying to get us up to speed on the entire history of schooling, basically. First-week reading included the LA Times value-added kerfuffle. Next week we’re into Adam Smith and Rousseau. EDUC 329X – Teacher Professional Development. Hilda Borko. What works and doesn’t work in professional development? How do you move a professional development program from “boutique” (where the person who developed the program also facilitates it) to a scalable, sustainable program that is effective for non-volunteers and can be facilitated by anybody? EDUC 465 – Pedagogy of Teacher Education. Pamela Grossman. How do other professions — nurses, rabbis, pilots, etc. — induct new members and what can teacher developers learn from them? Maybe my expectations were soft going in but I love every class. We’re doing three-hour blocks and all of the professors, many of whom are known more for publishing than teaching, know what to do with that time. The iPad is chewing its way through grad school and, with printing fees running ten cents per page, it may well pay for itself before this is over. I’m doing Papers for cataloging PDFs, SimpleNote for notetaking [BTW: SimpleNote scarfed two of my essays, reverting them back to their first saved state. I don’t recommend SimpleNote. ], Google Calendar for storing assignments. If the only outcome of these four or five years is a paper and a few letters after my name, somebody please punch me. Any advice from those who have been here, any questions from those who haven’t yet, you know where to put them. Intriguing Mathematical Problems, Dover Publications. I like this one for its sheer density of wrongness. In less than twenty words we get three notions that would be ridiculous in a real context: That the narrator would have a favorite orange, that we have to solve a contrived word problem to find its weight, and, the punchline, once we solve it, that this “orange” weighs nine pounds. My favorite orange weighs nine-tenths of its weight plus nine-tenths of a pound. What does it weigh? Scan an example of pseudocontext. List the textbook title, edition, and publisher. Let me know if you’d like credit (name, blog or twitter) or if you’d prefer anonymity. He’s a DFW-style expert, the kind of academic whose research is virally accessible to laypeople. He composes some relentlessly good rubrics for good math instruction. He commutes easily between the two warring math factions. I’m referring both to the evenhandedness of his most recent rubric and also to the grace with which he inserted himself into a debate at a recent math circle meeting concerning calculator use, the sort of debate that usually lures the blustering ideologues out of hiding but which saw the young Pickford articulating a lot of justice and respect between both sides. 2013 Jun 26. See every edition of Pseudocontext Saturdays. Instead of giving students realistic situations that they could analyze, textbook authors began to fill books with make-believe contexts — contexts that students were meant to believe but for which they should not use any of their real-world knowledge. Students are frequently asked to work on questions involving, for example, the price of food and clothes, the distribution of pizza, the numbers of people who can fit into an elevator, and the speeds of trains as they rush toward each other, but they are not meant to use any of their actual knowledge of clothing prices, people, or trains. Indeed, if they do engage in the questions and use their real-world knowledge, they will fail. Students come to know this about math class. They know that they are entering a realm in which common sense and real-world knowledge are not needed. We need to call pseudocontext out when we see it, call it out by name. 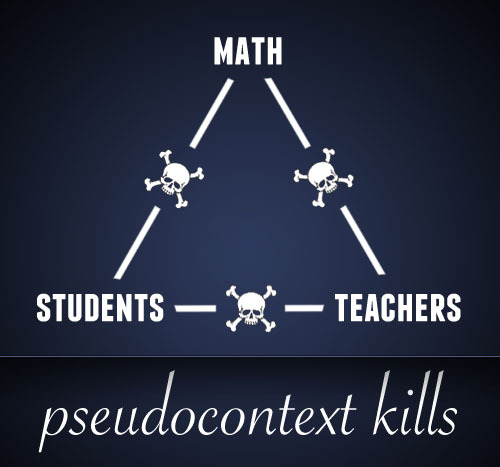 If we invite pseudocontext in our classrooms without condition, it becomes harder and harder to tell the difference between the real and the unreal. It becomes easier to excuse all kinds of bizarre unreality because, well, I mean, this is math class and in math class it’s possible to know that “in January of the year 2000, I was one more than eleven times as old as my son William while in January of 2009, I was seven more than three times as old as him” and yet not know how old your own son is. Then don’t pretend this is real life, okay, because everyone loses here. Students and teachers are alienated from mathematics and from each other.